This pet sympathy memorial gift bracelet set is a touching and thoughtful tribute to honor and commemorate a beloved dog or cat pet that has passed on, or simply to be worn as a celebration of love for all things pets. It symbolizes love and expresses condolences, and celebrates the constant love and adoration they have provided at all times. The gift comes with a card with a paw print theme containing wild flower & forget-me-not seeds built into the paper ready to be planted in your garden. The saying on the front of the card states "Gone from our lives, but never from our hearts," a perfect sentiment. Instructions on planting are on the back of the card. This purchase will provide a portion of the proceeds to the SPCA adopt a kennel program which will pay for all health care and behavior services for dogs in need and assists in finding them a loving home as all dogs deserve a home. Thank you for your purchase. Woof Woof! 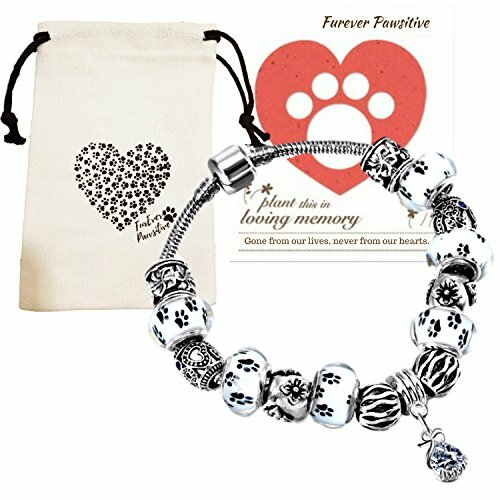 PET LOSS CONDOLENCE GIFTS SET - Help a grieving friend or loved one remember their special pet with this beautiful paw print bracelet & flowering seed gift card set. REMEMBRANCE GIFTS HONOR THE LOSS WITH MEANING - The bracelets have one cubic zirconia crystal charm representing your beloved lost pet. Murano glass paw print beads on the black & white bracelet, and heart designed beads symbolizing the eternal love. The flowering beads represent the planted flowers that will remind you daily of your special bond. In loving memory of your pet this purchase will also help support animals in need find a furever home. DOG & CAT LOVER GIFTS KEEPS GIVING - This gorgeously designed bracelet comes in a heart paw print themed storage bag & a plantable wildflower & forget-me-not seed condolence card with a warm message, the flowers will bring continued joy in loving memory of your sweet dog. The seed gift card has a lovely sentiment "Gone from our lives but never from our hearts." HIGHEST QUALITY: Black & White Glass Bead Bracelet = 8.5 inches. The Pink & Red Bracelet = 8 inches. Both have a silver plated snake chain, clasp for opening/closing. You can wear this bracelet every day and not worry about breakage and can be worn for upscale dressier events or casually daily. This bracelet gift set can be worn simply as a way to celebrate your love of dogs or to feel connected to a lost 4-legged friend knowing that you will see each other again. You will have their memory close by and take comfort that their soul has helped other dogs in need of love, care and everlasting support. Also great as a Dog Valentine or Cat Valentine gift, pet lover gifts or new puppy gift! If you have any questions about this product by Furever Pawsitive, contact us by completing and submitting the form below. If you are looking for a specif part number, please include it with your message.